Winter reading week is a time for many university students to catch up on coursework. But for members of Wilfrid Laurier University’s International Students Overcoming War (ISOW) club, it was time to move work forward. 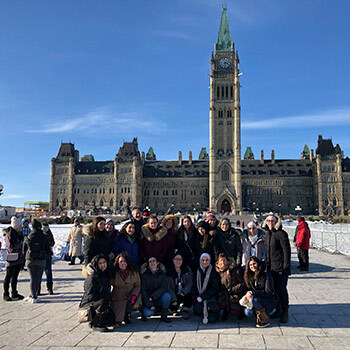 A group of 17 ISOW student leaders and scholars travelled to Parliament Hill to educate Parliamentarians about the opportunities ISOW provides and their need for increased funding. Increased ISOW funding would allow them to offer 43 additional scholarships for international students fleeing their home countries that are in conflict. Since 2015, ISOW has provided 16 scholarships, many to students from the Middle East. With support from the Honourable Bardish Chagger, MP for Waterloo and Leader of the Government in the House of Commons; Sen. Peter Boehm (BA’ 77) and Sen. Marty Deacon, ISOW student leaders and scholars met with key parliamentarians including the Minister of International Development and Immigration and parliamentary secretaries from Immigration, Refugees and Citizenship; Global Affairs; Finance (Youth Economic Opportunity) and senior advisors to other MPs. They also met with the Minister of Immigration, Refugees and Citizenship and members of World University Service of Canada. Watching political efficacy unfold was inspiring for the students who saw themselves as part of current and future processes. Syrian-born ISOW scholar Manar Naeem shared her story during the meetings. For Naeem, ISOW means more than financial support through scholarships: coming to Laurier has been a life-changing experience for her. Before coming to Laurier, Naeem was studying computer science in Damascus. With opportunities for future learning and her career limited in Syria, she chose to apply abroad to continue her education. Empowered by the support she has received through ISOW, Naeem began a fundraising initiative to cover the cost of medical expenses for children in Syria. She also works closely with ISOW’s student leaders to continue raising awareness for the club on campus and in the community. The ISOW team left Parliament Hill satisfied that they prompted several important conversations, including the possibility of a national scholarship program based on the ISOW model. The students also had a first-hand look at some of Canada’s political processes in action. During their visit, they attended two question periods and the Standing Committees on Citizenship and Immigration, and Justice and Human Rights. The group also attended Senate’s first sitting in its new chamber and were formally recognized by the Speaker of the House. Back at Laurier with end-of-term deadlines and final exams approaching, ISOW members are motivated more than ever by their experience on Parliament Hill.